Just past Spring at Kenmare—and upstairs from La Esquina! A choreographer finds beauty and grace in garbage trucks and, against the odds, rallies reluctant city trash collectors to perform an extraordinary dance spectacle. 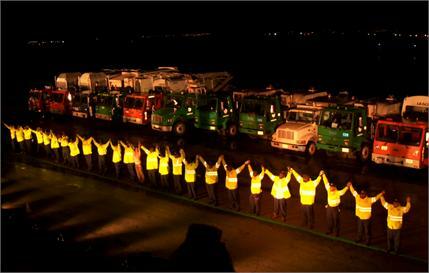 On an abandoned airport runway, two dozen sanitation workers—and their trucks—inspire an audience of thousands. Trash Dance chronicles this beautiful and unique work of art while also highlighting the way art can unite a community. Join New America NYC for a pre-release screening of Trash Dance followed by a conversation on the arts. This entry was posted in Art, Labor, Sanitation. Bookmark the permalink.